If you you're pinched for time but want to experience the visual beauty and history of the Canyon de Chelly we have numerous overlooks that you can drive yourself. However, if you'd prefer a more up-close, educational and interactive experience and want to see the canyon from the canyon floor then we would love to provide you with an exceptional experience with any one of our guides where you'll receive an in-depth look at the Canyon de Chelly and learn about its physical aspects, its history and culture and how it continues to live within the Navajo culture. Jeep Tours can last 3 hours or all day, depending on your available time and interests. You will not forget the stories or the beauty of the canyon. We depart from Holiday Inn, Best Western, Sacred Canyon Lodge, and hotels and campgrounds. Please provide your own lunch and drink for 6 hour or longer tours. 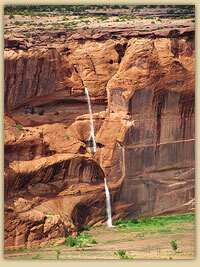 Navajo Nation Parks & Recreation charge a $2 per person tour fee. From March through November, the Navajo Nation observes Mountain Daylight Savings Time when the time will be the same as Colorado, New Mexico and Utah. A guided hiking tour into the Canyon and along the bottom floor is an excellent way to admire the superb canyon views. Your Navajo guide will share the natural history and traditions of the region, and answer your questions about life in Canyon de Chelly. Hiking tours vary in length from 3 to 8 hours. Our guides are Sylvia T. Watchman, Tulley Yazzie, Jerold John and Hadley Tsosie … all of whom are very educated on the Canyon and are some of the best story tellers around! Good hiking shoes, backpack, water, snacks, camera, sunscreen, cap/hat, straw hats, mosquito repellant, binoculars. Call us today at 928-675-6126 to book your tour today! Copyright © - Arizona Canyon Jeep Tours. All Rights Reserved. Site designed and hosted by Go-Arizona.com and GTS WebDesign.com.